Among the instrumented methods for assessing the volume characteristics of cardiac activity, ultrasound, MRI, and CT with contrast are well known. Conventional methods do not provide for measurement of the parameters of central hemodynamics and respiration in monitoring conditions. The possibility of multichannel electrical impedance technology allows the stroke volume and fractional output of the heart to be determined and the displacement of the ventricular walls to be visualized in real time with an accuracy no worse than 1-2 mm. 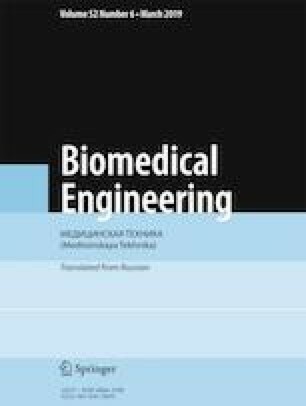 This article considers questions of the implementation of techniques for computing stroke and minute volumes of the circulation and displacements of the heart chamber by solving the electrical impedance measurement problem. Results of mathematical and physical modeling of cardiac activity based on precordial measurements are presented. Translated from Meditsinskaya Tekhnika, Vol. 52, No. 6, Nov.-Dec., 2018, pp. 6-10.
http://www.who.int/mediacentre/factsheets/fs317/ru/ (accessed October 22, 2018). http://www.draeger.com/sites/ru_ru/Pages/Hospital/PulmoVista-500.aspx?navID=289 (accessed October 22, 2018). http://www.swisstom.com/en/products/elisa-800vit-2 (accessed October 22, 2018).